Happy Day-After-Easter! Did you have a good Easter Sunday? Last week I played a little with my newest research toy, The Portal to Texas History, which I wrote about in this post. A great picture popped up. 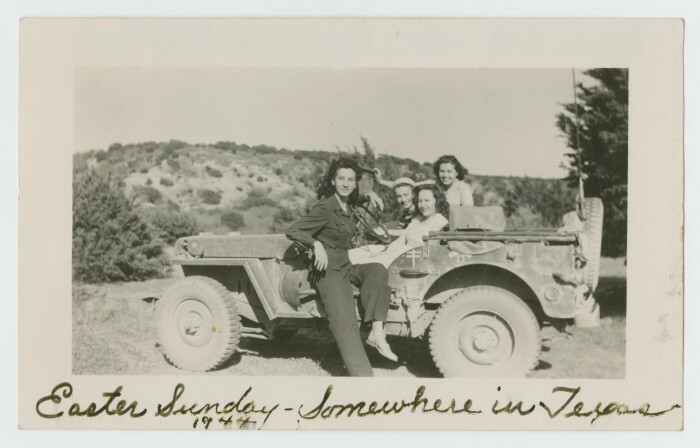 It shows four women “somewhere in Texas” on Easter Sunday, 1944. Small clusters of cadets, officers, and other staff dotted the far edge of the flight line, mostly shadows in the bluing darkness. As they hurried to the crowd for windbreak, Josie glanced over her shoulder toward the east. Pink tinged the horizon. God was about to serve up another morning. She’d never grow tired of those sunrises, those sunsets. Especially the sunsets, when she felt more alive, more awake to enjoy it. She blinked, still bleary-eyed. While his prayer droned, Josie sneaked a peek past the chaplain’s shoulder. The light kept coming from the land. It reached up and over the rolling, open plains. Stretched to the craggy hills off to the south. Kept climbing to the sky and out to her. Was this beauty what Mitch witnessed every day, in heaven? Did Jesus see a sunrise like this that first Easter morning? Despite rapid blinking a tear blazed a trail down her cheek. She let it fall unchecked. Another thought invaded. Pete loved sunrises, the crazy rooster. What was he doing right now? Could he see this same sunrise? Great. More grief. After a few minutes and during a hymn, those first bright rays seared the dark and jabbed her eyes. She had to clamp her eyes shut under its brilliance. But her nose warmed a smidgen, then the rest of her face. She joined the singing. Her face felt good with the exercise. Their voices carried far across the flight line. The thawing of the land couldn’t make their breath invisible. She peered at the group around her, past Maggie, past Otto. With each exhale it looked like dozens of tiny steam engines sighing. She grinned. Trying not to appear conspicuous, she swung her gaze to the other side of the crowd. Warmth filled her. The crowed absorbed some of her hollow grief, just a little. The hymn ended. As the last note faded into the golden sky, movement caught her from the corner of her vision. She jerked her head. There, hurrying away from the huddled group. Betts? Chill ran through her. What was that snake doing here? Then came the shame. What was it about her that set her off so easily? The mental list grew long, sure. But did it have to? She closed her eyes. At once a mind’s eye picture flashed. Betts scurrying away, but she didn’t walk alone. Jesus matched her stride, his comforting arm holding her steady. She snapped her eyes open. So Jesus cared about even someone like Betts? She chewed on the thought for a moment. Her own unspoken words started to sound ridiculous. Of course Jesus loved “someone like Betts.” Her cheeks puffed with a blown breath and she shifted. It might take her longer to feel the same. She held too many sorrows in her heart today to make room for the unpleasantness of Betts. “Thank you.” The whispered words in her hear jarred her thoughts and made her jump an inch. Josie chuckled to herself and looked at Maggie. She knew what she meant and leaned sideways into her friend for a moment. “You’re welcome, Mags.” A few heads around them turned to frown their disapproval for the disruption. The words of the chaplain’s sermon rose with feeling, warmth matching the dawning day. He held his notes loosely and gestured with them. Then a West Texas wind gust swooshed from the east and scooped his notes, scattering them like confetti. The chaplain and those in front grabbed in vain for the dozen or so papers. Otto couldn’t help adding a “Hee heee!” of delight. Josie stood, transfixed, and watched the papers fly to freedom. The chaplain had held them in his possession. He had ordered them just so, as he wanted them. Then nature dallied with him, on its whim. Almost made a joke of his sham of control over this morning. His careful planning all for naught. Sympathy stretched from her soul toward his dance to grab what he could. Josie watched as some of the papers remained in flight, out of the reach of the helpers. The strengthening sun touched a few of them just right. She looked down at the packed ground. Those papers cast shadows, here and there. It struck her as a beautiful chaos, like the paper tube kaleidoscopes she’d peered through at the Taylor County Fair. The breeze kept the dance going for a several moments, some staying far, some flying away. The shadows kept bearing witness. Josie felt odd. It would stick in her memory as one of the prettiest things she’d ever seen. The chaplain gave up with a sheepish smile. He waved his arms to conduct the congregation in a final hymn. How about you? Tell us about a memorable Easter you’ve had.